During model classes horses are shown in hand. Horses are judged on how closely they match the breed standard for conformation. In addition, judges evaluate the horse on gait at the flat foot walk. In the performance ring, Fox Trotters are judged against the breed standard for gaits. Horses compete in either two gait (flat walk and fox trot) or three gait (flat walk, fox trot and canter) classes. Horses three and under are only eligible to show in two-gait classes. Horses competing in the Amateur division do not canter until age five. Fox Trotters in the performance ring typically exhibit with a standard bridle including a brow band and cavesson. Saddles should be western. Horses also wear ribbon in their forelock and mane. The ribbons help illustrate the rhythm of the horse. There are exceptions to the tack described above depending on the requirements of the specific class. The versatility arena covers a variety of competition classes. These classes may include western pleasure, horsemanship, English, reining, barrel racing, pole bending, and ranch horse competitions. These classes follow the same guidelines as other breed competition for these events with one exception. In most classes, horses are asked and expected to perform a fox trot. Below is a brief summary of MFTHBA Exhibitor division. For complete and official descriptions, exhibitors should refer to the latest copy of the Official Handbook: Rules, Standards & Policies (link). 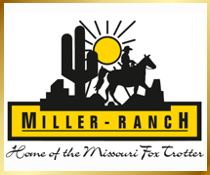 Open: Open classes are open to any registered Missouri Fox Trotting Horse. There are no restrictions on ownership however the owner must be a current MFTHBA member. All exhibitors in Open classes must be a current MFHTBA member and hold either a Amateur, Youth or Professional card. Entered horses much meet the age and gender requirements of the class and be registered with the MFTHBA. Open Amateur: Open Amateur classes are open to any Amateur Rider. There are no restrictions on ownership of the horse except that the horse’s owners must be current MFTHBA members. Exhibitors must be current MFTHBA members, must hold a current Amateur Card and be age 18 or older. Entered horses much meet the age and gender requirements of the class and be registered with the MFTHBA. Amateur Owned: In Amateur Owned Classes horses must be owned by the Amateur member who is exhibiting the horse or owned by immediate family members as defined in the MFTHBA Handbook. Co-ownership with individuals outside the exhibitor’s immediately family makes the horse ineligible for this division. The owners of the horse as well as the exhibitor must be current MFTHBA members. The exhibitor must also have a MFTHBA issued Amateur or Youth card. Entered horses much meet the age and gender requirements of the class and be registered with the MFTHBA. Amateur Owned and Trained: This division must meet all requirements for the Amateur Owned Division. In addition, entered horses may not have been professionally trained. However, it is permissible for a horses to be started a person other than the amateur owner for a period not to exceed 30 days. Starting under saddle is meant to convey breaking, including saddling, accepting the bit, forward motion, stop, and responding to the reins. A period not to exceed thirty (30) days will be permitted. No additional training by a Professional is permitted for horses shown in this division. No Professional Training 90 days: Horses entered into this class may not receive professional training 90 days prior to the show. Limited Rider: Exhibitors may not have won a Performance WGC or Reserve WGC at any time, excluding Novice and Youth divisions. Exhibitors may not have won a 1st or 2nd place in any MFTHBA performance class, excluding Novice/Apprentice and Youth, in the last two calendar years. Youth who have won Non-Youth performance WGC, Res WGC, or 1st/2nd place, may not show in this division. Novice: Exhibitors may not have won a Reserve World Championship, a Reserve World Grand Championship, or 1st place in any MFTHBA Performance class, excluding Novice/Apprentice and Youth divisions. Once an individual has won an Amateur Novice or Amateur Apprentice Division Championship they may no longer show in Amateur Apprentice classes. Youth who have exhibited and won in Non-Youth performance classes may not show in this division.